I want to write today about a story that has been in the News the last couple of days. 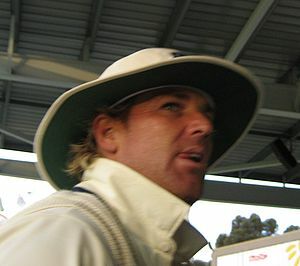 Reader’s Digest published their list of the 100 most trusted people in Australia, and the person who came in position 100, Shane Warne, has been labelled the Least trusted celebrity in Australia. Now, I’m sure Warnie doesn’t need me to go in to bat for him, but I’m not a fan of this misreporting that has been occurring. While Warne is the least trusted celebrity in this list, there are plenty of well-known celebrities who did not make the list. Just because he came last in the list, doesn’t make him the least. A few other observations that made me smile. Andrew Wilkie, the Independent MP from Tasmania was the most trusted Politician, at 35, beating out Stephen Conroy (61, Highest Labour MP), Rob Oakeshott (65), Anna Bligh (QLD Premier, 69), Bob Katter (73), Barnaby Joyce (80), Joe Hockey (Highest Liberal MP, 84), Julie Bishop (88), Bob Brown (89), Kevin Rudd (92), Malcolm Turnbull (94), Wayne Swann (95), Julia Gillard (Prime Minister, 97) and Tony Abbott (Leader of the Opposition, 98). I also found it interesting to note that the three Independent MP’s who helped decide who would be the Prime Minister – Wilkie, Oakeshott and Katter – are among the most trusted politicians in the country. In the battle of Morning TV, it seems that the ladies are more trustworthy than the blokes. Lisa Wilkinson, host of the Today show, came in at 50, with Sunrise’s Melissa Doyle at 53. Today Show co-host and Gold Logie winner, Karl Stefanovic, placed 62, while Sunrise’s David Koch came in at 67. Dannii Minogue, who came in at number 77, was just pipped by her sister, Kylie Minogue, who placed as the 75th most trusted person. Current Australian Cricket Captain, Michael Clarke (68) was seen to be more trustworthy than his predecessor, Ricky Ponting, who placed 83. Of the top 10 most trusted people in Australia, 5 of them are Scientists or involved in Medicine. Lauren Jackson, three-time Olympic basketball player, is our most trusted sportsperson. In the top 100, there are 19 sports related people, 3 from AFL, 2 from NRL, 5 from cricket and 2 from Soccer. The highest average position for those sports was NRL (36.5) followed by Soccer (38.5), Cricket (63.4) then AFL (84). In the battle of the Comedians, Adam Hills came out on top, placing 15th, ahead of Chris Lilley (23), Charlie Pickering (27), Hamish Blake (45), Magda Szubanski (54), and Shaun Micallef (57). Adam Hills is also the highest placed of this years Gold Logie nominees, beating Rebecca Gibney (40) and Karl Stefanovic (62). Other Gold Logie nominees Asher Keddie, Chrissie Swan and Jessica Marais did not appear in the list.